"Hello and welcome to MotorWeek, we're glad to have you with us!" 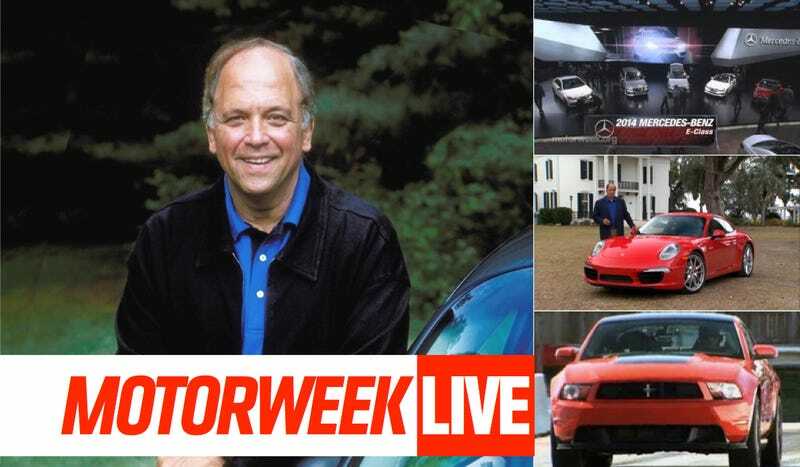 Host John Davis has opened every episode of MotorWeek with that line since the show started in 1981. Now in its 32nd year, MotorWeek is a show that every single car enthusiast has watched at least one time. Now, Mr. Davis has graciously made his time available to answer all your questions about television's original automotive magazine. Consider this MotorWeek Theater Live. MotorWeek is the longest running and first consumer oriented TV program with dedicated automotive reviews. MotorWeek airs on 92 percent of all the PBS stations in the nation as well as Discovery's Velocity Channel. It even airs in Spanish. Every episode reviews cars in the same way. There is typically a thorough examination of the design and features, as well as thorough performance testing. This is where MotorWeek stands apart. Everything from Lamborghinis to Toyota Tundras hit the slalom and drag strip to get the same baselines. If you read our site, you know that I have a bit of a soft spot for MotorWeek. Every evening I do a tongue in cheek post that features a video from the series. The truth is, I really enjoy the program and have been watching since I was a kid. There wasn't really anything else to satiate the automotive appetite of a car hungry youngster. I got the chance to meet Mr. Davis at the Detroit Auto Show, and he said he'd be happy to come on our site and do a Q&A with you, our faithful readers and MotorWeek Tifosi. Jump in below. John will be around for the next hour to answer your questions. UPDATE: Note from John below. Thanks everyone! It was a pleasure having the chance to answer so many questions and thanks to all that submitted them. I am sorry I cannot get to all of them. Again, I greatly appreciate the change to join you on Jalopnik and look forward to having you watch MotorWeek.